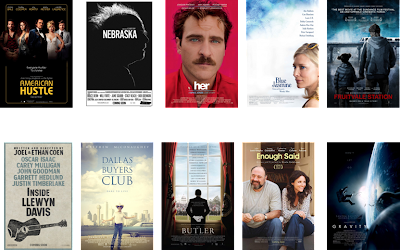 The rundown: WGA’s slate included three likely nominees from familiar names in this race: American Hustle, penned by David O. Russell (and newbie Eric Warren Singer), Her, from Spike Jonze, and Blue Jasmine, from Woody Allen, who would mark his sixteenth nomination in this race. Nebraska, by Bob Nelson, is also probable. I’m not as confident about the fifth film cited by the WGA, which has experienced a surge lately, Dallas Buyers Club. I think that film has been praised too much, and it won’t see as much Oscar success. Two choices that haven’t been doing too well are Inside Llewyn Davis and The Butler, both of which are very possible, as is Enough Said, which might also earn an acting nod for James Gandolfini and would be well-suited for this race. Gravity has the worst shot here out of every single race, but it could still pop up. I’m pulling for what I worry will be the only spot of recognition for Fruitvale Station, a very deserving entry that would be a welcome inclusion in this category. One possible crazy scenario: After being ignored most of awards season, a different Matthew McConaughey film - Mud - makes a comeback. Forecasted winner: It would be wonderful if it was Her.